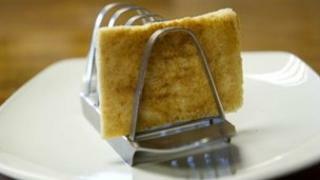 A piece of toast, said to have come from Prince Charles's breakfast on the day he married Princess Diana, is to be auctioned in Derbyshire. The mother of a Buckingham Palace maid, who was visiting her daughter at the time of the 1981 wedding, claims to have taken the leftover slice. Auctioneers Hansons said the unusual item could fetch up to £500. The wedding of Prince Charles to Lady Diana Spencer on 29 July 1981 was watched by a worldwide television audience of 750 million. Mrs Smith said: "At the time my daughter was a maid at the palace and one of her duties was to collect Prince Charles's breakfast tray from outside his room. "I was with her in the corridor and saw Prince Charles had left some toast on the tray. I had been thinking about a keepsake from the wedding and saw the toast and thought to myself: 'Why not'? "We hadn't talked about it much down the years but William and Kate's wedding last year and then the Queen's Jubilee has made the Royals more popular than ever. That got me thinking that my toast could be worth a bit of money. "I just wandered into the auctioneers out of curiosity and asked them if it was worth anything. I was pleasantly surprised to hear them agree with me that it could be of quite some value to Royal collectors." The 31-year-old slice will go under the hammer in Etwall, Derbyshire, on 19 July. It is believed to have been well preserved because it had not been buttered and the toasting had dried it out. Auctioneer Charles Hanson said: "I suspect Prince Charles was a little nervous on the morning of the big day and this little piece of toast survived. "It could do quite well. We hope worldwide collectors will appreciate this little bygone of Royalist history." Clarence House said it had no comment to make on the sale.